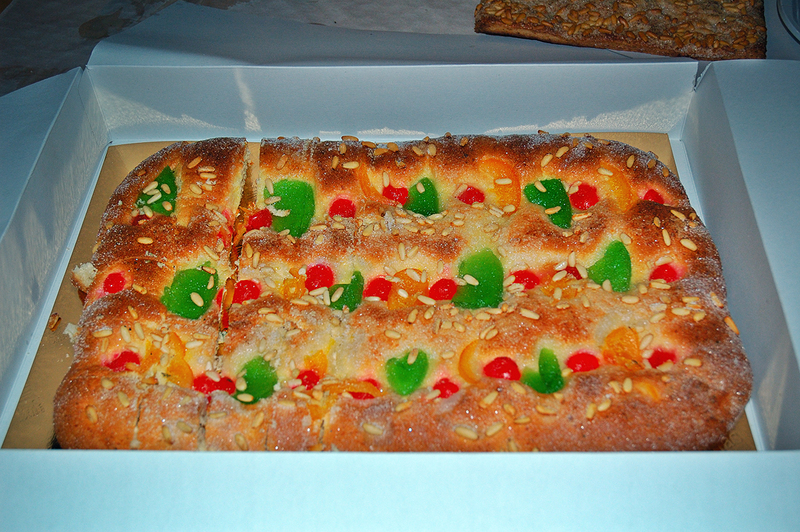 This is what is known as coca de Sant Joan, a traditional light sweetbread covered with candied fruit. As the name suggests, it is a kind of pastry to be consumed during Saint John celebrations when it is sold in huge amounts and as you can guess there are the cheap and the expensive ones. They can be tasty and spongy or an authentic hard rock. The cheapest you buy at the supermarket but if you want the best stuff then you'd better go to your favorite pastry shop. Besides the candied fruit "coca", there are other kinds, like coca de crema (cream filled pastry - this is the one I like the most), coca de llardons (suet pastry)...to have a better idea learn about cocas de San Juan via Wikipedia. Maybe you prefer the recipe: Candied Fruit and Pinenuts Cocas. Como trabalho numa empresa de Barcelona, já tive oportunidade de provar e é muito bom.